There are dozens and dozens of films that tell the story of Dracula. This one differs from the usual characterization by portraying Dracula as the hero and essentially a nice guy. Hardly the monster that we hope to see in a film like this. The story of Dracula Untold revolves around Prince Vlad, who rules Transylvania around the mid-15th century (which is the reason why a medieval website gets to review this film). We are told that when Vlad was a boy he was sent to serve in the Ottoman Turk’s armies, where he suffered abuse but became a fearsome warrior, and gained the nickname ‘the Impaler’ for his ruthlessness and savage treatment of his enemies. 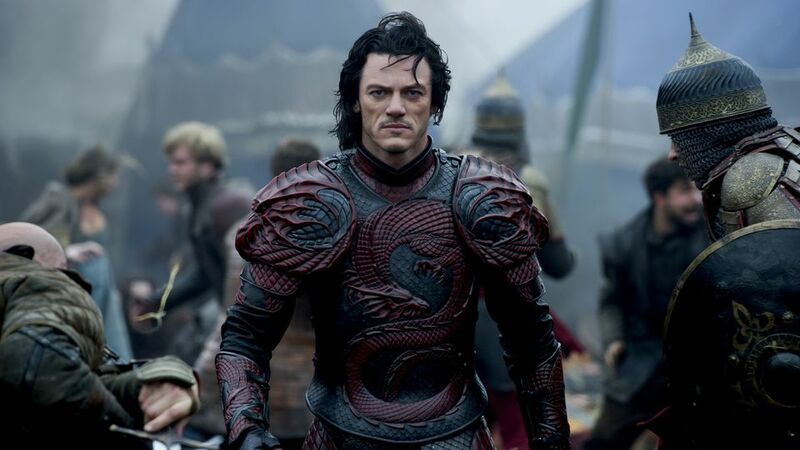 However, we get to see Vlad (played by Luke Evans) after he has returned home to Transylvania, where he is a decent and well-respected ruler that loves his wife and son. He grumbles a little about the Turks, but he is also good friends with the Sultan Mehmed II (Dominic Cooper). However, when the sultan sends orders demanding 1000 Transylvanian sons be sent him to become Janissaries, Vlad is faced with a difficult decision of either sending his child or facing an invasion from the Ottomans. Being a good father, he chooses to fight the Turks, but since he has no army to fight them, Vlad goes to the a mountain cave where an ancient vampire exists. The vampire is played by Charles Dance, whose time in Game of Thrones has solidified his reputation of being a great actor in portraying the mastermind villain. Vlad wants the vampire’s powers so he can fend off the Turks, and the older vampire makes a bargain with him – he will let Vlad drink some of his blood, which will give him the vampire’s powers for three days, but if he drinks more human blood during that time, he will stay a vampire for eternity. Vlad, thinking it will be relatively easy to go blood-free for three days, accepts the deal. He soon wakes up and learns that he has all these new powers, including super-hearing and seeing, the strength of a hundred men, and the cool ability to turn into flock of bats when he needs to travel. When the first army of 1000 Turks comes to attack his castle, Vlad slaughters them with ease. There are many plot holes in this film – for example, the vampire warns Vlad that his thirst for blood will become unbearable, however with the exception of one time where he gets turned on by his wife’s neck, this problem never resurfaces. Moreover, for someone who gets powers that allows him to decimate the Turks single-handedly, Vlad spends much of this time trying to get himself and his family to a safer place instead of going out and attacking Mehmed and his men. More problematic for this film is that Vlad retains much of his humanity despite having this great and evil power. We get hints that this is all supposed to lead Vlad down a dark road, but the movie decides not to go there, and we don’t get a very compelling Dracula. Dracula Untold is about 90 minutes long (relatively short for a film these days) and will be a forgettable movie for most of the audience. The acting is fine enough, and the fight scenes and the special effects are pretty good, but this was a movie that lacked the monster it needed. A couple of medieval notes – we get to see the cliche of the medieval feast complete with the man eating the big chicken leg with his hands, but it was nice to see a film where the main religious character doesn’t turn out to be a duplicitous and corrupt figure.